The Liars Club: The Weather Gods smiled on Saturday! The weather radar looked very ominous at 5:30am on Saturday as I made sandwiches and put together lunch for the day's float trip. As daylight broke I could see the ever-darkening skies southwest of Blue Ridge. But that is all part of being a fishing guide; sometimes you live and die by the weather, you just hope for the best and take what you're given. I met my two guys for the day, who were more concerned with the fact that they were going fishing over any weather problems and were determined to make the best of it. My kind of guys! We pushed off from the bank about 9:00am under heavy overcast skies and a falling barometer. That, coupled wi th the lack of people, just gave me a sneaking suspicion that this could be a good day if the weather holds. 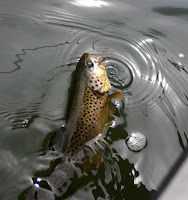 As soon as our flies started hitting the water we began to see some action. Very few “large” bugs on the water, but the surface was littered with little (size 28-32) midges. If you saw a rising fish and got a good cast in front of him he either bumped your dry or took a swing at your dropper. We caught a lot of browns today. More than I have been catching over the past few weeks. Fortunately the weather held out for us today. Chad was keeping an eye on the weather radar for us with phone in hand to warn us if things started to get sporty. After we got back to shop he was happy to report that the huge storm coming out of Alabama had split in two and went around Blue Ridge. I must be living right! All-in-all we boated around 25-30 fish, a mixed bag of 9-12 inch browns and rainbows with a few 14-16 inch rainbows. We missed that many more. Lightning-fast strikes and small midge droppers will make you talk to yourself sometimes. There were not a lot of rising fish to site-cast to, but they were actively feeding and a good drift through fishy looking water usually resulted in a strike. Right as the water caught us a very light sprinkle of rain started to fall, but by that point we were headed to the take-out anyw ay. The weather Gods smiled on us today. That guy is REALLY good at catching fish on tailwaters. He was trying to teach me a little bit the day I floated with him and just about every other "demonstration" cast and drift he made, something took a look or he caught something.